On March 16, 2013, the District of Columbia Parish Units hosted the Annual Communion Brunch honoring St. Louise de Marillac at Our Lady of Perpetual Help Catholic Church in Washington, DC. Monsignor John J. Enzler, President/CEO of Catholic Charities for the Archdiocese of Washington (CCADW), was the keynote speaker. 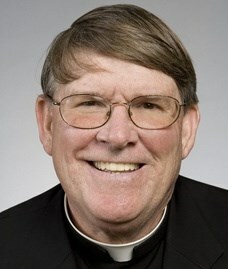 In May 2011, Msgr. Enzler was appointed by Cardinal Donald Wuerl, Archbishop of Washington, to lead CCADW. It is his vision to have a ministry like the St. Vincent de Paul Society or the Ladies of Charity in all 140 parishes throughout the Archdiocese to be available to serve the daily needs of the poor in our community. He provided us with some statistics, saying out of the ten (10) highest ranking household incomes in the United States, the Washington Metropolitan Area has seven (7) counties that ranked in the top ten (Loudoun, Fairfax, Arlington County, Howard, Prince William, Fauquier and Montgomery County). This was a surprising statistic given the homelessness within our region. Of the five (5) major areas of church life: worship, education, community, service and administration/stewardship, CCADW’s mission is to focus on service. Under his leadership, CCADW has received a donor to provide $30 million over a five (5) period to help people get jobs. The donor‘s wish is to focus on jobs so the poor can go from poverty to sustainability. This action is a positive move toward systemic change. Currently, CCADW provides shelter for approximately 600 women and 900 men every night. The majority of the homeless in our community only get one meal a day and that is usually at night when they come in off the streets. Msgr. Enzler wants to find ways to serve them daily breakfast as well. In his presentation to the Ladies of Charity, Monsignor repeated two quotes that I found meaningful to remember. The first was a quote from St. Francis saying “… preach a sermon everyday; and, if needed, use words.” This statement lends itself to service, letting our actions speak louder than words. Lastly, the second quote came from Mother Teresa which was “…. it’s fashionable to talk about the poor, but not so fashionable to talk with the poor.” What a powerful statement. We must remember when we serve the poor; we are serving Jesus Christ himself. When you look into the face of someone less fortunate than you, always be mindful, you are looking at the FACE OF JESUS! All I can say is what a blessing it is to be able to serve.